Thanks Altis, I'll be getting the heavy flamer guy up soon! Like the way you do your metal colours and not forgetting your red.....Nice one!! I'm sure it'll be silly pretty like the rest of your XVII, but will that heavy flamer have a pilot light? Drilling bolters... Will come to this once I get a proper drill... Now pilot light? Edited by Captain Semper, 02 February 2016 - 10:41 AM. I really like that red, I was going to go darker with mine but in tempted to go for a shade similar to yours. Great painting. Very clean with good contrast. My only comment is that, for WB, they appear too clean-cut. 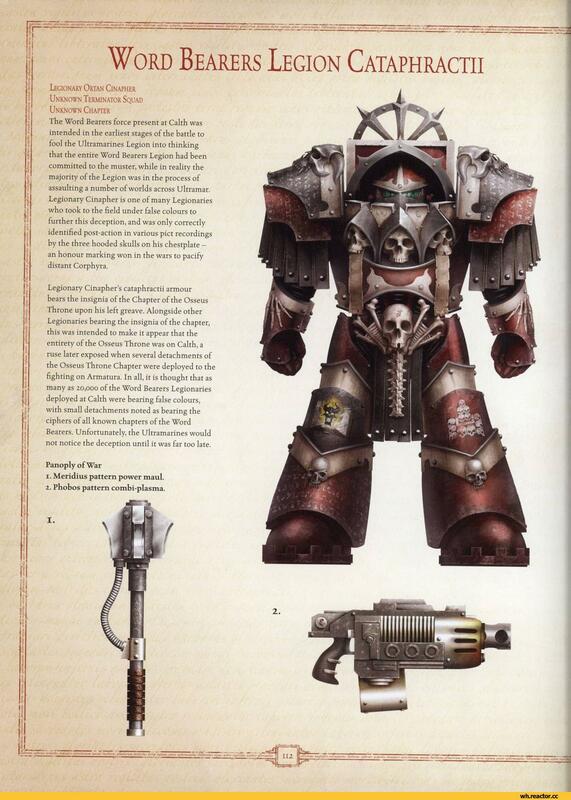 Originally the word bearers had armor of a dull gunmetal. They only re colored red after their fall to chaos. And they didn't just side with Horus like many legions, they willfully sided with and worshipped the gods of chaos. For a legion in thrall to the dark gods, I would expect a little less crisp clean appearance. I would expect to see religious script on the armor, chaos stars, devotional ribbons on their armor. The beginnings of demonic faces in their iconography. Edited by Foehammer888, 03 February 2016 - 01:02 AM. Very nice WBs mate, they are a lot LOT cleaner than mine, but the look really works. And I love the placement of the different colour elements, breaks up the model but doesn't look confusing. Don't worry - I'm totally aware of the background on WBs. As regards the script on the armour - it is left out by choice as I'm afraid it'll ruin my work (seen it happen)... I do plan however to add some of the decals provided in the B@C box once I have finished all of them, as a treat for managing to complete my first WB squad. Thanks for your comments - we're in agreement! Well, Sheep, I think your work is in a totally different level mate! Thank you for the encouragement - I intend to keep true to the WBs until I completed the list in the first page at least! Dream on Heretic! When the ETL comes, I'll stand by the First, the Honoured, the Sons of the Lion! Edited by Captain Semper, 03 February 2016 - 07:22 AM. Finally got here, nice thread mate. Wicked baddies. Nice update! The pictures look a bit better too. And my offer to help out via PM is still open. Thx Dos! Here's the complete unit! Great job chief! Errr Cap'n! So daemons yay or nay? In any case I got plenty of stuff to go on right now with the Tacticals an'all. Awesome treasonous dogs XVII Legion I normally go for a much darker red, but as others have said, you pulled this shade off really well and it looks fantastic. May I enquire how you made the background for your 'display' pictures above (i.e. not the ones on the gaming board)? Edited by Captain Semper, 14 February 2016 - 07:07 PM. As always your work is amazing brother! Very schmexy Bearers of The Word, Semper. Great scheme for the termies, too. Edited by Captain Semper, 21 March 2016 - 06:25 AM. Your word bearers look great Captain! That Tac squad just popped up! Looks great, really liking your bases too! Semper... you gotta cut it out. Every time you throw down an update I catch myself looking at my own Word Bearers thinking "hmm... repainting you all in a matte scheme like Semper's wouldn't take that long would it?"